← 9as Jornadas gvSIG: taller de geomarketing. Forzar reproyección a EPSG:4326. Aunque la vista no esté en este sistema de coordenadas, el KML resultante se reproyectará para ser visualizado correctamente en Google Earth/Maps. Labels. If labels are enabled in the source vector layer, then they will be shown as floating texts using the default format in KML files. Conversion to EPSG:4326. 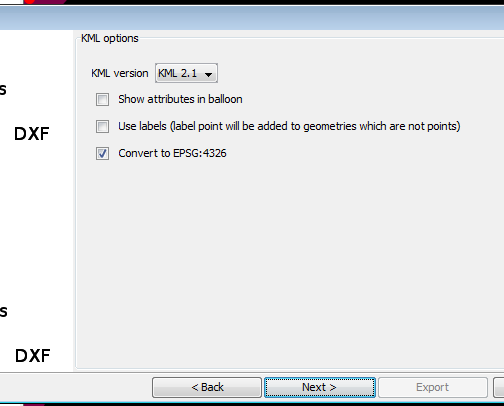 Even if the view is not in EPSG:4326, this option will create a KML file in EPSG:4326 (standard CRS for KML files, so it will be correctly visualized in Google Earth/Maps). This entry was posted in development, english, gvSIG Desktop, gvSIG development, spanish and tagged gvsig, gvSIG 2.0, kml. Bookmark the permalink.